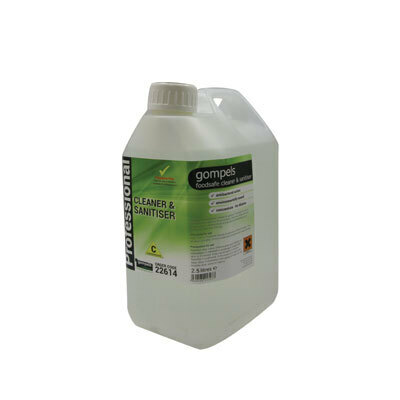 Developed for use in areas of food preparation or catering environments, our self branded Gompels Concentrated Foodsafe Cleaner Sanitiser has been formulated to offer high-powered and fast results. The powerful antibacterial action cuts through visible dirt and grime while being gentle enough for use on children's toys with it's fragrance and residue free design. Leaving surfaces clean, shining and sanitised, this large and economic 2.5 litre bottle boasts a secure screw down lid and large handle for distributing throughout your work place. Highly concentrated and powerful foodsafe cleaner. Create a cleaning station with our Metal Dispenser, and Display Board Store this product plus our Gompels Concentrated Floor and Hard Surface Cleaner and Gompels Concentrated Antibac Room and Washroom Cleaner. Our Cleaning Chemicals category is packed with exceptional value products from our Gompels Chlorine Tablets through to our Gompels Concentrated Toilet Cleaner.